In a small bowl, combine the three fruits. Stir until evenly distributed. Set aside. To assemble: place 1/4 cup granola in each of 4 clear glasses (juice size or dessert dishes). Then, top the granola of each cup with 1/4 cup yogurt. Next, add two spoonful (soup spoon size) of fruit on top of the yogurt. Sprinkle with toasted coconut. Repeat steps 2-4 until cups are full and all the ingredients are used up, ending with fruit and coconut for a pretty presentation. If desired, you can add chopped macadamias on top as well. Parfaits are a great way to mix up your breakfast routine. Or if you are like me -- someone who doesn't really love a bowl of cereal with milk -- they are a staple! But they aren't just for breakfast either. Parfaits make delicious and healthy desserts for after dinner. One of our favorite types of parfaits to make is Tropical Fruit Parfaits. They are especially good if you can find coconut yogurt, but vanilla is just fine as a substitute. 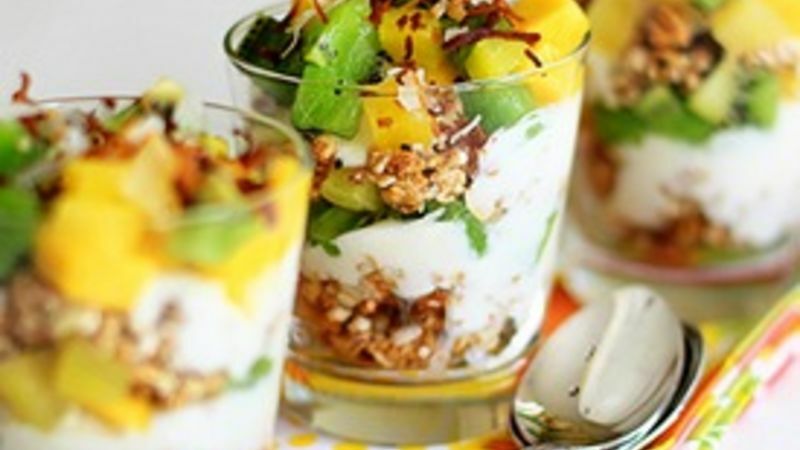 I love the juicy flavors of tropical fruit combined with crunchy granola and creamy yogurt. It is so refreshing! For an extra protein boost, try Greek-style yogurt, which typically has twice the protein of regular yogurt. That makes this recipe a perfect post-workout snack. If you have children, consider prepping all the ingredients and setting them out in bowls so everyone can assemble their own. Mine think this is lots of fun. You can use any bowl, but I love to use clear juice glasses so you can see all the colorful layers inside. Tip: to toast coconut, sprinkle the coconut on a piece of foil. Place the foil on top of the rack in your toaster oven and toast for 2-3 minutes (on mine I select the lightest setting for toast). Keep an eye on it though, because coconut can burn easily.